Sakarya Cad. 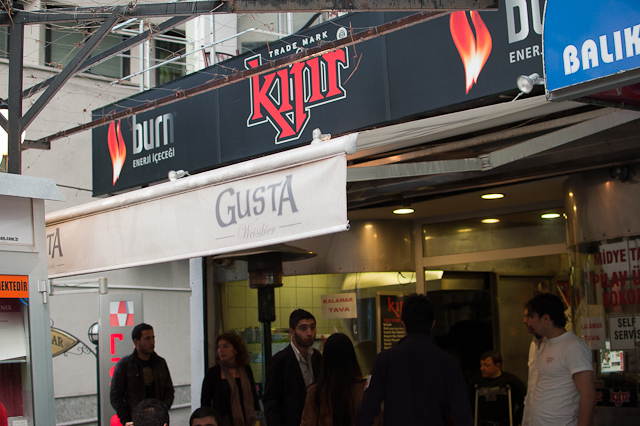 is a mecca for fast food lovers in Ankara. This bustling pedestrianized boulevard in the heart of Kızılay contains a plethora of quick eats, offerings diverse Turkish favorites such as balık ekmek, lamacun and kumpir. The most popular, though, is without question the döner kebab, Turkey’s most famous contribution to world cuisine. Across the globe, the ubiquitous sight of meat cooking on a vertical spit is a fixture of city life. It is only a minor exaggeration to suggest that there are approximately 2.56 döner shops per capita in Ankara. 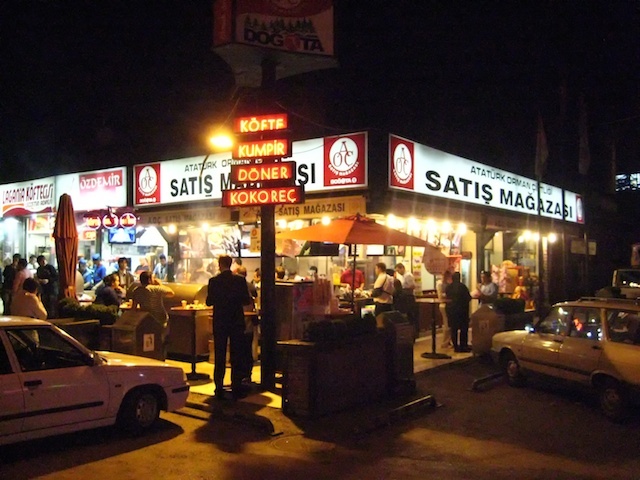 On Sakarya alone, there are dozens of establishments making this cheap and tasty kebab. The best is Gülsoy Fast Food, located at the intersection with Bayındır Sk. (Google Maps). You might ask what separates one döner kebab from the next as it isn’t exactly a complicated dish to prepare. But in my experience (which after fourteen months in Turkey probably numbers over a hundred) there are clear differences. Freshness is chief among them. The rotating nature of döner lends itself to being overcooked; meat is allowed spin all day, becoming drier and drier with each turn. Many shops also buy sub-par meat in order to save on cost. Other places keep their bread or lavaş past its shelf life or use a lackluster garnish of old lettuce and onion. Gülsoy tends to avoid these pitfalls and is noteworthy not only for its freshness, but also for its use of better ingredients. Soslu döner is a common variation of the dish in Ankara, where iskender tomato sauce is added to the kebab to tastefully increase moisture. But Gülsoy has something better: a herb-based version that adds flavor without excessive liquid. Together, these factors make for the best dürüm on Sakarya and have made me a regular customer whenever I’m in the area. 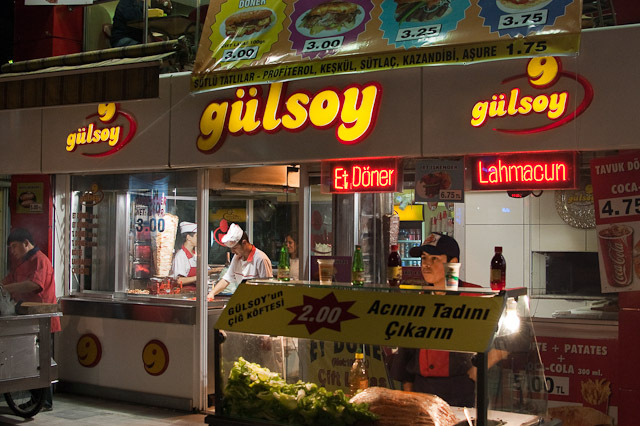 Like most fast food stops in Kızılay, Gülsoy is very cheap. A delicious tavuk döner costs a mere 3TL ($2 at 1.50TL/$), although this week for an unknown reason they were selling at the ludicrously low price of 2TL ($1.33). 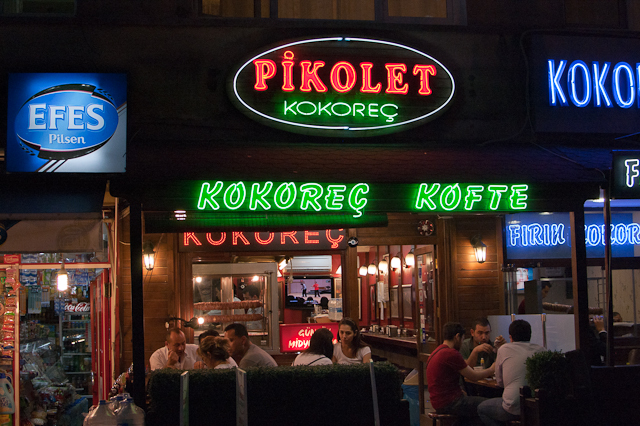 The kokoreç is noteworthy as well and is priced at 2.50TL ($1.67) for a çeyrek (quarter) serving. 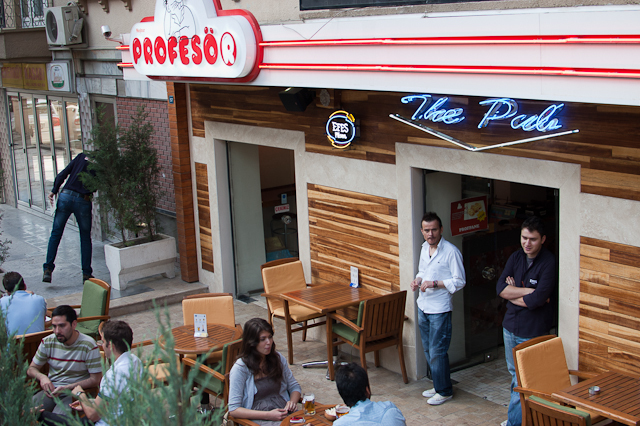 Ulus is one area of Ankara that is not often frequented by the city’s expat community. Many Turks go to great lengths to dissuade foreigners from visiting this older, poorer and more conservative neighborhood. Some have gone as far as to suggest that one risks physical harm if he dares to walk these streets. In my experience, these fears are entirely exaggerated. I have encountered some of the most cordial and welcoming people in the city during my trips to Ulus. This year I have been making a habit of doing my produce shopping at the Ulus Hali (Google Maps), a large wholesale market on Alsancak Sk. The fruits and vegetables are half the price and twice the quality of what I get in Bilkent. The men who work the various stands are also very friendly and appreciate the novelty of a yabancı (foreigner) in a distinctly local place. Through their recommendations, I discovered Çino Kokoreç. Adjacent to the market’s entrance, it’s a popular place to enjoy the deliciousness of lamb intestine. A yarım portion (one half) will cost you 4.50TL ($3 at 1.46TL/$).